I have two sons, two years apart. Both are autistic and have special needs; and those needs definitely differ from each other. My youngest loves animals, and even calls the zoo, “Jungle." He ALWAYS wants to go to the jungle. My eldest, on the other hand, would rather play in the park all day, every day, or play video games if he can. So, bringing both to the zoo can be quite a challenge in order to satisfy and tend to both of their needs. Our trips to the “jungle” are usually short, lasting no more than two hours (we can spend all day there if we really wanted to experience everything). 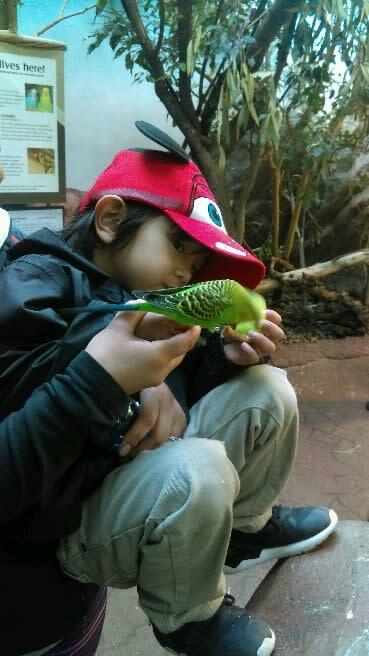 What’s nice is that Woodland Park Zoo has attractions and areas to accommodate both my sons’ needs. Below is a short and sweet summary of the top 5 things they love to do (so far). We haven’t been able to visit the entire zoo yet, but I’m sure once we do, they will find more favorites in their visits as there is so much to do and see at Woodland Park Zoo! While my youngest loved ALL of the Savanna animals – especially the zebras, lions, and hippo., my oldest was all about the African Village! In the village, you can play on instruments. His favorite was the drum. You can climb in and out of houses/huts, and you can even lay in the beds! *The African Savanna is located on the south side of the zoo. The closest parking lot is Hippo. Not only do you get to see the gorilla family up close and personal, you can even take photos with their statues next door! It’s a great place for kids photo ops, and my eldest loved it! *The Tropical Rain Forest is located south of the west entrance and northwest of the South Entrance. The nearest parking lots are Penguin (to the west) and Hippo (to the south). The gorillas are on the north side of the Rain Forest Loop. Yes, you read correctly! BearS (as in more than one)! 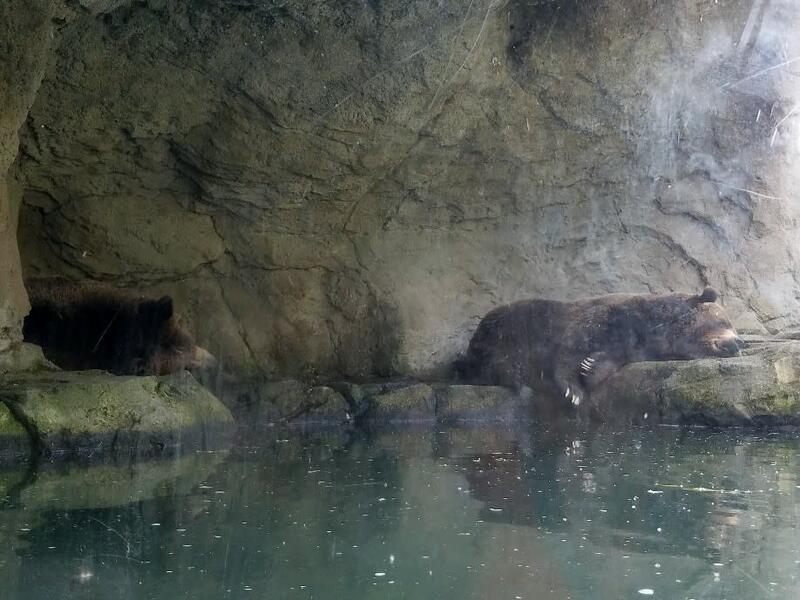 As many times as we have visited Woodland Park Zoo, we have never seen, or even knew there were TWO brown bears! We lucked out with the weather, and that’s when we found them relaxing in their cave, near the water. You can see salmon and otters swimming around, too! My youngest didn’t want to leave! *The Northern Trail is located on the north side of the zoo. The nearest entrance is the West, and the closest parking lots are Penguin and Bear. The brown bears are right around the corner from the grey wolves and snowy owl. This was our very first time trying this with our boys, and our youngest loved it! We ended up buying 2 sticks to feed the birds, and he ended up using both (and of course, he wanted to buy more). It was definitely a sight to see when the bird flew right on his stick to eat the seeds! I highly recommend trying this if you haven’t already! *Australasia is located east of the West Entrance, and the nearest parking lot I Penguin. Bird Feeding is right next to the Willawong Station (where the kangaroos and kookabara birds are located). Every time my kids saw a statue or a figure of an animal, they immediately wanted to climb on it. Having two boys, two years apart, can be quite a handful, so when they stop, I try my best to take advantage and snap photos when I can. 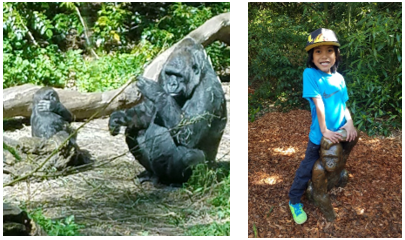 I think we were able to take a photo in each “area” of the zoo. Now I need to try and get more photos of them together or even a family photo somewhere in there!